I love this video. All of our cats had morning routines; one of our favourites was endearing because his wake-up ritual extended to sitting by our heads and purring. If the noise didn't work, he would occasionally extend a paw to the head. The cat in this video, though, is more like another of ours, who would gladly do what it took to get some breakfast on the go. A chuckle I picked up from my Facebook feed. More things you should know about the evil things your cat is up to, via the Oatmeal's Mathew Inman. This bit of Cheezeburger will likely appeal to people who have owned cats. I have to say, though, that we once had a cat (a tabby, not too unlike the one above) who was generous with cuddles on demand - albeit his demand. When he wanted to get on your lap, he was getting on your lap, regardless of what you were doing or thought about it. For the last few months, I've been having fun with my Facebook friends by posting a photograph, and then asking them to write the caption. Some (many, actually) of the responses have been great, often laugh-out-loud funny. Now and again, I'll post the image here, with some of my favourite captions. * I pulled out the choke, now why won't this thing start? * I know I can get dese up over dat dang wire. * Catapull. Kitten contemplates string theory. From the good people at 9gag. We're cat people in this house, even though we don't have any now. (Bloody allergies. Sigh.) I'm not given to insanely cute pictures of cats, although I do chuckle at funny cat pictures, as family and sharp readers may know. But this one was too charming to resist. I came across it a few days ago (through Tumblr, I think; I forgot to make a note of the source), and showed it to Martha. It reminded me of how kids find it hard to give up teddy bears as they age. And other fonts and felines. My sister Lisa (who loves cats as much as I like typefaces) drew my eye to it. It was produced by 9Gag, and was seen here. 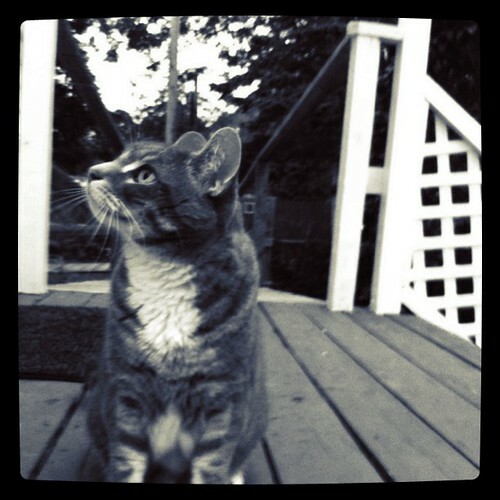 "To bathe a cat takes brute force, perseverence, courage of conviction - and a cat. The last ingredient is usually hardest to come by." 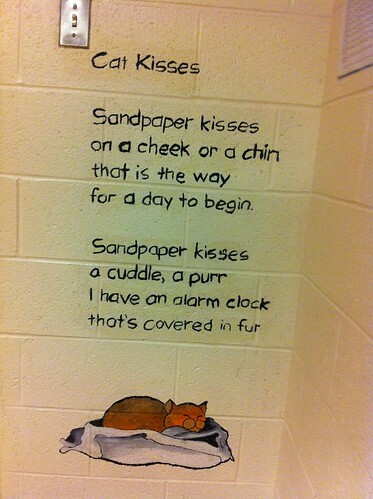 This is a poem painted on the wall of Nick's school. It's hard to walk by and be cynical! This is one of my favourite scenes in Puss In Boots: Antonio Banderas and Salma Hayek's cats squaring off in a bar, with the other cats chipping in on percussion, etc. Too funny. The clip was posted today to YouTube. Wow, this made us laugh. I actually wanted to find the new Puss In Boots TV commercial that's on now, promoting the upcoming movie; i instead found this, a parody/homage to the Old Spice commercial. This my parents' cat. An interesting animal. Let's put it this way: in his mind, there is no doubt about who's boss. "Never play cat and mouse games if you're a mouse." Oh, another bloody Star Wars T-shirt I'm going to have to buy. Ever had a cat bring home a dead thing that it wanted you to have? That's the inspiration behind this shirt, called Cat-At Loves You. Cats are fascinating ... but getting one to stay still is rather pointless. Such is the point of this hilarious video. 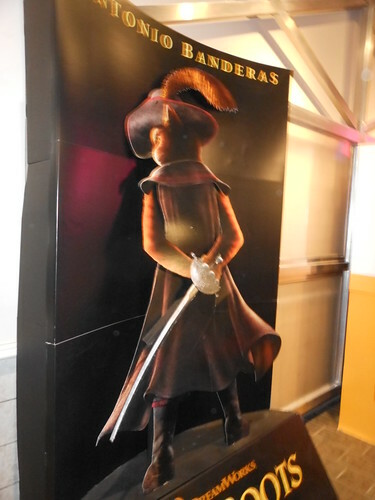 During recent trips to the movie theatre, we noticed this display for the upcoming Puss in Boots animated feature, with Antonio Banderas hamming it up as the lethal feline. B. Kliban - his first name was Bernard, but he signed his work with his first initial and his surname - has been dead for more than 20 years, but he appears to be primed for a comeback. 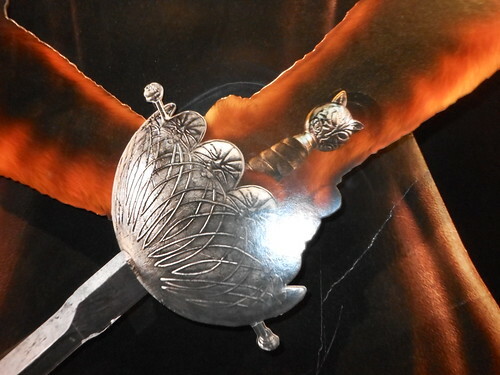 That is, his iconic work featuring plump tabby cats is ready again for the spotlight. 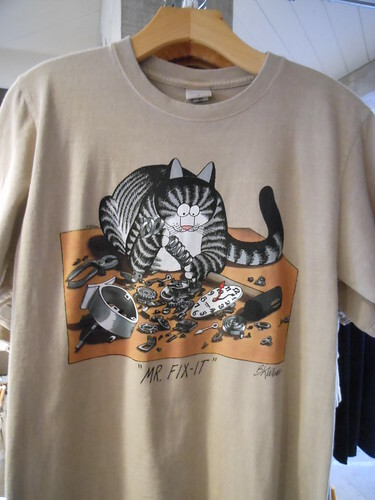 We became aware of this in a shop that specialized in T-shirts, and which was prominently displaying a host of Kliban products like this one. Martha and I have spent more than a few dollars over the years on Kliban-related merchandise; in fact, it's one of the things we knew we had in common at the start. We still have several mugs (including an original "Love to eat them mousies" one that I generally don't use, to keep it in decent shape), T-shirts, calendars and of course books. 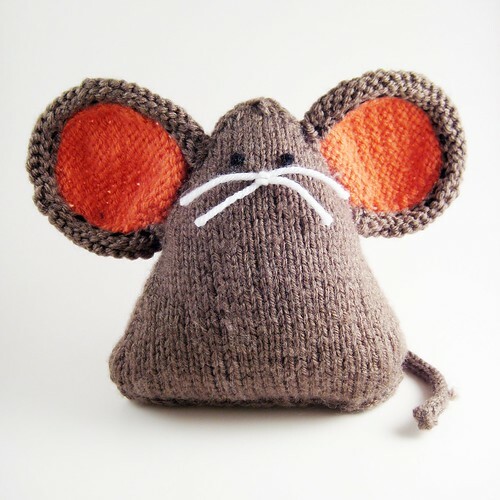 The official site, I was pleased to see, is called eatmousies.com. Family and friends who've known us for a while will know that Martha and I had a cat named Bellybutton, who was a spitting image of the Kliban cat. Just as jolly, too. Bellybutton went to the great scratchpost in the sky many years ago, but we're reminded him of all the time. It's cheering to see that the original works have not gone out of style. From I Can Has Cheezburger, something with a Victorian flair, with a bit of a steampunk kick, no? Thanks to Michelle for the pointer to this one. I needed the laugh.